Executive summary: The lack of fairness and accountability in Congressional elections is drawing welcome attention. Democrats in the 2012 elections won only 46% of House seats despite winning more votes than Republicans .More than three out of five races were won by landslide margins of at least 20%, women remain deeply under-represented and the number of centrist and independent legislators declined again. But most analysts overlook the real problem: the 1967 law mandating that states elect U.S. House Members in single-member district, winner-take-all elections. A lack of voter choice, the distortion between voter intent and outcome, and the reduction of centrist legislators has relatively little to do with the redistricting process of 2011 compared with the very fact of districting itself. The fundamental cause of partisan bias in the House is that Democrats are relatively concentrated in urban areas, and the fundamental cause of the lack of voter choice in most elections is that most areas of the country have a clear partisan lean. Gerrymandering is problematic, but is not the root of our electoral dysfunction. Confronting the reality that winner-take-all rules are at the heart of the problems with our elections points us to the only reform solution: the adoption of fair voting systems. These American forms of proportional representation are based on voting for candidates in larger districts with more than one representative. By allowing like-minded voters who make up 20% of the vote to elect at least one of five seats, those seats will reliably represent the left, center and right of every district - resulting in a truly representative Congress. This year's elections put a spotlight on the troubled nature of how we elect the House of Representatives, the alleged "people's house." But some of our smartest election experts don't seem to understand the root of the problems with House elections. More importantly, they fail to communicate that it's simply impossible to address those problems within the straightjacket of single-member district, winner-take-all elections. As one example, take Attorney General Eric Holder's otherwise laudable speech in Boston on December 11th on the subject of expanding and upholding the right to vote. Holder said, "We should consider reforms to the redistricting process for state and federal offices - so districts are drawn in a way that's neutral, that promotes fair and effective representation for all, and that can't be abused to protect incumbents and undercut electoral competition." That sounds wonderful, as does the implication in a December 15th New York Times news story about problems in U.S. House elections that independent redistricting would result in House elections accurately reflecting voter preference. In fact, it's an utter illusion to expect that the adoption of independent redistricting could come close to achieving the seven values that we believe any fair electoral system should promote: accountable leadership, responsive government, electoral competition, geographically coherent districts, fair representation of racial diversity, fair representation of women, and fair opportunities for everyone to cast meaningful votes in every election. In fact, it's unlikely that any redistricting plan can achieve more than two of these seven objectives. But there is a way to accomplish all seven goals with just one electoral reform: passing statutes to enact fair voting proposals for congressional elections. It's time for analysts to confront the implications of this reality if we want our country move toward a representative democracy fit for the 21st century. In this analysis we will focus on the problem of winner-take-all elections through the lens of U.S. House races, but transformative change may come sooner to our state legislatures. They are easier to reform through ballot measures and tend to be even less representative than Congress. Most state legislative chambers are run by one party for decades at a time, if not centuries. Incumbents are often even more cushioned from electoral accountability, with two out of five state legislative races won in uncontested races this year. Such dominance and lack of competition is primarily grounded in winner-take-all elections, not gerrymandering. Let's start our review of House elections with the simple premise that elections should uphold majority rule. This year, the outcome of the elections defied that principle. Democratic congressional candidates won the most votes in U.S. House races, but Republicans won 33 more House seats. Remarkable examples of distorted outcomes include Republicans in North Carolina and Pennsylvania winning 22 of 31 seats despite losing the popular vote in both states. Whole regions were dominated by one party. Democrats won all 21 U.S. House races in New England, while Republicans won all 22 congressional districts in the line of states stretching from Arkansas to Idaho. Most congressional races across the country were no-choice landslides, with more than 63% of races won by at least 20% or not contested at all. Women's representation increased by only 1%, leaving men again with more than four in five House seats despite the once-in-a-decade opportunity for winning in new seats triggered by redistricting. The already-shrunken caucus of House moderates saw its numbers sharply reduced yet again to levels far short of its support among voters. Deeply disturbing as they may be, most of these problems aren't new. Congressional elections have distorted fair representation and marginalized most voters for decades. But the rising dominance of partisanship in governing how people vote has locked down election outcomes more than at any time in the modern era. Structural inequalities have been brought to the fore, including the basic fact of allowing a party to control the House after being defeated at the polls. Democrats had a very good 2012 election. In the presidential race, Barack Obama defeated Mitt Romney by 126 electoral votes and nearly five million popular votes. Republicans won only eight Senate races, the worst performance for a major party in Senate races since the 1950's. In House races, Democratic candidates won about a million more votes nationwide than Republicans. After controlling for factors like vote inflation for incumbents and uncontested races, the data suggests voters generally preferred Democrats for Congress by a 52% - 48% margin, underscored by the fact that not a single Democrat lost in the 181 most Democratic districts. And despite widespread popular concern about Congress being too polarized, losing incumbents came heavily from the moderate wings of both parties. Yet Republicans won a comfortable majority of 234 to 201 seats. That disparity in voter preference compared to seats did not result from ticket-splitting; in fact, there were only 24 districts in which one party's nominee carried the presidential vote and the other party's nominee won the congressional race, all but four of which were won by an incumbent. The real problem for Democrats was that in a year in which Barack Obama won a decisive presidential election victory, he apparently has carried only 207 of 435 congressional districts. The results were so incongruous that many commentators have identified structure as the likely explanation. We welcome attention to structure, given that the centrality of its role is too often overlooked in explaining election outcomes and parties' policy preferences. In this case, however, the great majority of analysts utterly missed the real story. Again and again, they suggested that the problem was the Republican-controlled redistricting process in 2011-2012. By naming the wrong cause of the distorted election results, they miss what is most in need of reform. Among many examples of this line of thinking, the Daily Kos identified redistricting as the reason for the Republican victory "pure and simple". Mother Jones published a much-shared investigative report that suggested Republicans won because "they drew the lines." Think Progress described Republican gerrymandering as "a simple explanation for how this happened." Slate published an article called "How Ridiculous Gerrymanders Saved the House Republican Majority." The Brennan Center touted the use of independent redistricting as the way to ensure "ordinary citizens [have] their voices heard." All of those claims are, at best, highly misleading. They're not wrong that partisan gerrymandering is a problem-it is, as FairVote has argued for years-but in suggesting that gerrymandering is sufficient to explain why the Democrats unjustly lost the House this year, why Congress is so dysfunctional and why most Americans live in no-choice congressional districts. "Gerrymandering routinely gets blamed for such mismatches, but that's only part of the story. Far more important than redistricting is just plain districting: because so many Democrats are city folk, large numbers of Democratic votes pile up redundantly in overwhelmingly one-sided districts." To be sure, Republicans certainly benefitted from redistricting, as FairVote demonstrated in its analysis this summer. They controlled the redistricting process in many large states, and won several more seats this year than they would have otherwise as a result. But the Republican victory in the 2012 House elections isn't explained by the relatively few seats they gained through gerrymandering. Although 52% of voters at the polls had an underlying preference for Democrats, Democrats won only 46% of seats. As a result, Republicans won fully 25 more seats than they would have if the outcome had been reflective of voter preference. Nor can gerrymandering explain the dramatic collapse of congressional moderates, who typically are Members elected in districts leaning toward the other major party. With only 10 members set to represent districts that favor the opposing party by more than 52% to 48%, the nation's substantial bloc of centrist voters will be even more woefully underrepresented than Democrats. There was another factor at play, almost entirely ignored by most pundits. It is the real root of the representation problem in our country and could be changed by a simple federal statute: winner-take-all elections. That fact may seem inconvenient or disruptive to how people think about our democracy, but it can no longer be seriously disputed. It's time to stop living in a world of delusion about how our elections work. The idea that recent Republican gerrymandering alone caused the 25-seat Republican distortion is discredited by a simple look at district partisanship. There are currently 241 districts in which Barack Obama underperformed his national average in 2008. Before redistricting, there were 232 such districts. A report by the Brennan Center similarly showed a gain of 11 districts favoring Republicans compared to 2010. Further quantitative analysis from political science professors writing for the Monkey Cage reached similar conclusions. Changes in districts alone clearly don't explain the partisan imbalance, although they did exacerbate it. Another partial explanation is the effect of incumbency. Because incumbents usually have the advantages of greater name recognition and greater funds, they tend to get a boost of a few percentage points over challengers - what FairVote calls "the incumbency bump." Since there were more Republican incumbents running than Democrats in 2012, it makes sense that Republicans would win a few more seats than Democrats even in a neutral year with unbiased districts. But incumbency only goes so far. Take a very recent counterexample: the 2010 elections, in which Democrats had an even greater incumbency advantage than the one enjoyed by Republicans in 2012, as 230 Democratic incumbents ran for re-election in 2010. Needless to say, that advantage did not save the Democrats from losing control of the House by a wide margin. Looking at this year's elections, our analysis shows that incumbents overall had an edge of about 4.5% of the vote more than what a candidate of their party would have received in an open seat race - with Republican incumbents enjoying about a 2.5% boost (meaning an overall effect on margin of 5%) and Democratic incumbents a 6% boost (increasing their margin by some 12%). The incumbency bump certainly helped Republicans, but probably only by about 5-10 seats. There were 29 incumbents whose victory margins fell within the 9% margin boost that incumbents enjoyed on average, and thus likely would have lost without it. Given that 58% of incumbents running this year were Republicans, only about five more of those 29 seats would have switched towards Republicans than towards Democrats in an incumbent-neutral setting. Even if we attribute ten of the 25 Republican-distortion seats to gerrymandering and five to incumbency, that still does not account for the two further seats they would have needed to win control of the House and the eight additional seats necessary for Democrats to earn the 226 seats that would have accurately reflected voters' preference in this year's election. Furthermore, if only gerrymandering and incumbents were to blame for the 2012 Republican victory, there would not be so much compelling evidence of a Republican congressional bias even before the 2000 and 2010 redistrictings. In 2000, for example, George Bush lost the national popular vote by more than a half million votes, but carried 21 more House districts than Al Gore, as detailed in FairVote's 2011 report Fuzzy Math. FairVote's first Monopoly Politics report in 1997 also showed a stark Republican bias in a decade in which Democrats had largely controlled redistricting. Democrats held most state legislatures during the redistricting process that followed the 1990 census, but in 1996 there were 239 districts leaning toward Republicans and only 196 toward Democrats. Gerrymandering and incumbency are not sufficient to explain the extent of the Republican House victory in 2012. The problem runs deeper for Democrats - and all Americans who believe in the importance of leadership that is electorally accountable to their constituents and risks being booted out if voters perceive that they have failed to do their job. We have that accountability in races for governor and, to a lesser extent due to antiquated rules governing the Electoral College, the presidential race. But it's lacking in elections for Congress and most of our state legislatures. With most voters responding either positively or negatively to the presidency of Barack Obama in 2010, the congressional elections that year marked a distinct increase in partisan voting behavior, as evidenced by how Republicans' congressional election success was confined nearly entirely to districts leaning toward their party. The election exposed a fundamental partisan bias that has existed, relatively unnoticed, for decades. The Democratic Party's national and statewide candidates have for decades earned particularly strong support in cites and some suburbs, while the Republican vote is more efficiently distributed in the greater number of districts outside of cities. That imbalance doesn't matter in senatorial and presidential elections that pool together all the votes from a state - as evidenced by the 2012 presidential election, in which Barack Obama had an easy Electoral College win despite carrying only 22% of counties. But as suggested by Hendrik Herzberg, it's a different story once states are carved into smaller legislative districts. The more concentrated Democratic vote results in very imbalanced outcomes that waste the participation of many urban voters. Winning an urban district with 80% of the vote has no more impact on representation than winning the district with 55% of the vote. When a state is competitive statewide, those extra votes from imbalanced districts can't help Democrats across the state. Democrats' relative concentration of votes has a more pronounced impact on House elections today primarily because of our heighted partisan climate. Before 1994, Democrats were routinely able to win in Republican-favored districts - especially in the South, where Democrats dominated in white-majority districts. Although diminished by the electoral revolution represented by the 1994 election, this phenomenon continued to a significant degree until 2010, in the form of the "Blue Dog" caucus of Democratic moderates that was a mainstay in Congress. After the 2008 elections, for example, after two elections in which their party had a national party preference of more than 6%, Democrats held 32 congressional districts in which the partisan lean was more than 54% to 46% advantage for Republicans. After the 2010 election - the first wave election for Republicans since 1994 - that number declined to 13. Despite voters' overall preference for Democratic candidates in the 2012 elections, Democrats in these more Republican districts declined even further to nine. In contrast to Democratic successes in Republican districts when Democrats had "wave" elections in 2006 and 2008, Republicans did not do especially well in Democratic districts in 2010. That year, they did not gain a single seat in districts with more than a 55% Democratic partisanship and in fact lost their only two seats in such districts. But unlike Democrats, Republicans don't need to win seats in Democratic territory due to their inherent advantage in House districts that is due far more to the natural partisan demography than redistricting. The Republicans' big House win was grounded almost entirely in districts leaning their way - and the 2012 election reinforced that pattern, as their losses were primarily in Democrat-leaning or only slightly Republicans-leaning districts. When seeking to gain a majority, Democrats have no such luxury, as they can only control the House when dozens of Democrats win in districts that will be carried by a Republican presidential nominee in a nationally competitive year. The sharp decline in the number of candidates able to win in the other party's turf is also the key reason for the dwindling number of centrist representatives. Members of Congress are much more likely to vote moderately when representing a district favoring the opposing party rather than one favoring their own, even narrowly. In 2012, four Democratic incumbents lost against non-incumbents - all of them in strongly Republican-leaning districts. On the Republican side, nine incumbents lost among the 17 Democratic-leaning districts they held going into the election, but only seven incumbents lost among the 173 districts they had held with a Republican lean. Democrats still could win a majority in the House under current winner-take-all, single member district rules, but one of two things would have to happen in order for them to regain control. First, they could persuade Republican-leaning voters to start splitting their tickets again. Democrats then would have to sustain that ability to earn the support of Republican-leaning voters even in years like 2010, in which national preference goes against them. But this option seems implausible in the near future. The 2012 election results kept a Democrat in the White House, which means that any pro-Democrat voter backlash against an incumbent president - the key to the wave elections for Republicans in 1994 and 2010 and for Democrats in 2006 and 2008 - is at least six years away. The 2012 elections also showed little progress for Democratic candidates in Republican-leaning districts, and there is no indication of a pattern of ticket-splitting re-emerging. Such a rise in ticket-splitting likely would require a Republican being elected president in 2016 and then facing a bad midterm election in 2018. The second hope for Democrats is a major national tide in their favor that endures for several election cycles. Some analysts see the rising number of non-white, Democratic-leaning voters as inevitably putting the party into long-term dominance. While this may happen - and count us as skeptics about its inevitability, as parties usually adapt to new electorates when they must - it has little impact on the immediate future. This year, the 'tipping point' congressional district -- the district that would have given the Democrats their 218th seat and a House majority had they won all districts with a lower Republican margin of victory - was won by a Republican by a margin of 6%. That margin suggests that the Democrats needed to add 3% more to their national preference for an overall preference of about 55% of voters and a popular vote margin in actual votes cast of more than seven million votes to win even a slim majority in the House. Such a wave theoretically could happen, but is exceptionally rare in House elections. It's certainly not likely to happen in the 2014 midterm elections, where historical patterns show that the party of a second-term incumbent president at best holds its own. After the Democrats lost their Blue Dog advantage and ticket-splitting declined, redistricting indeed made things even worse. Because the Republicans were so successful in the 2010 elections for state legislatures and governors, they were able to control most states' redistricting processes in 2011-2012. That control was the death blow to the already-faint Democratic chances of retaking the House. Gerrymandering made it even harder for the remaining Blue Dogs to stay in office and gave just enough of a cushion to Republican incumbents to make them invulnerable absent personal scandal, a return to ticket-splitting, or a historic national Democratic tide. Once identifying partisan redistricting as the main problem in House elections, analysts inevitably focus on just one structural solution: converting to more independent redistricting processes along the lines of Iowa's criteria-driven rules or California's independent redistricting commission. Nonpartisan and bipartisan redistricting commissions are already used to some degree in nine states with more than one district, and often represent a positive change for the redistricting process by making it far harder for partisans to help their political friends and hurt their political enemies. But they do little to resolve the partisan bias in House elections, are often not trusted by racial minorities concerned about upholding voting rights, and do little to promote balanced representation of the left, right and center in Congress. Analysts such as those at Fells Stats have made the assumption that nationwide independent redistricting commissions would produce purely proportional results. That assumption would only hold true if a commission's first and dominant priority was to create districts that accurately represented the partisanship of the state as a whole. In theory, it is possible to draw district lines that would always create a House that accurately reflects the will of the American people, but only through "reverse gerrymanders" that would spread urban voters out into suburban and rural areas. 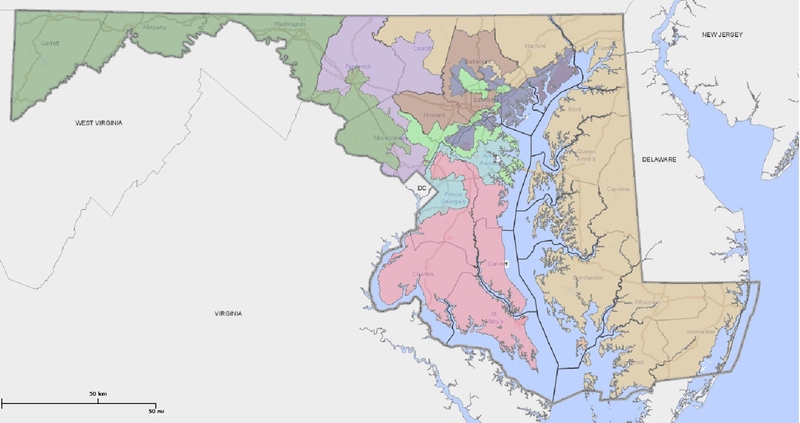 Those maps end up with districts looking like the spokes of a wheel, as in the incredible congressional gerrymander conjured by Democrats in Maryland in 2011. Accurately representing the partisan popular vote of the state is not even listed as a criterion, much less a priority. Nor is it likely to be a key consideration as long as we continue to place importance on values like compactness, contiguousness, and incorporation of city borders and geographic features -- and districts drawn without consideration of these factors would essentially defeat the purpose of having representatives for specific geographic districts in the first place. The 2012 elections show the futility of relying on independent redistricting committees to provide voter choice and fair representation in the House. There were only 10 candidates of either party in 2012 elected to Congress in districts with a partisanship favoring their opponents by more than 2%. That leaves just 36 districts within the 48% to 52% partisanship band in which voters were likely to have a meaningful choice in who represents them in Congress - only one out of every 12 congressional seats. Outcomes in even relatively balanced districts were largely governed more by voters' views of the parties than the characteristics of individual candidates. You simply can't gerrymander the nation into solely 50-50 districts - and even if you could do so, fair representation would be unlikely. It's no surprise, then, that independent redistricting commissions prioritize factors other than creating competitive districts when drawing their maps. The prevalence of largely noncompetitive districts and the structural bias against Democrats in the House will persist even if independent commissions are implemented nationwide. The difficulty faced by Democrats - and, more broadly, by urban and suburban voters - is shown clearly by red-blue partisan maps of the nation by county and congressional district based on the 2012 election. They demonstrate that drawing compact districts would leave the Democratic vote under-represented in the House because of its concentration relative to Republicans. As indicated in the county map, Romney defeated Obama in nearly four of every five counties. Those county successes translate into congressional seat wins for the Republican Party when representation in House elections is determined more by where you live than what you think. Seeing how winner-take-all dominance crosses state lines makes it clear that redistricting tends to only reflect partisan imbalance, not create it. It is the combination of winner-take-all elections, single-member districts, and partisan polarization that is the root cause of our distorted representation and lopsided outcomes in the House. The real problem at the root of the Democratic demographic disadvantage is the statutory decision to elect House Members exclusively through single-seat, winner-take-all elections. Democratic candidates win by huge margins in many urban and suburban districts, while Republicans win by smaller but still very safe margins in many more districts. The differences are stark. Democrats represent 47 districts with a partisanship or more than 70% to 30% in their favor, while Republicans represent only 23 such districts. Of the 16 districts with a partisan split of at least 80%-20%, Democrats represent 15. The best way to remove the structural unfairness inherent in the current House of Representatives is to get rid of winner-take-all elections. FairVote has a plan to do just that, grounded in our Constitution and American electoral traditions. The first requirement is an act of Congress. The more ambitious plan would be for Congress to prohibit winner-take-all elections in all states that elect more than one House Member. A more modest step would be to repeal the congressional mandate for states to use single-member districts that was established in a 1967 law. As described and demonstrated for all 50 states in our Fair Voting 2012 report, FairVote's plan would combine existing congressional districts into multi-seat "super districts" of between three and five members, in which members would be elected using fair voting systems - American forms of proportional representation based on voting for candidates. These voting methods have already proven their effectiveness in our local elections and, in their one sustained use, in state legislative elections in Illinois. Choice voting, our preferred system, has been used in more than two dozen American cities and is currently used for at least one local or national election in Australia, Ireland, Malta, New Zealand, Northern Ireland, and Scotland. Choice voting is a ranked choice system in which like-minded voters who make up 20% of a district would be sure of electing a candidate to at least one of five seats. It would reliably result in balanced and accurate representation of the left, center and right of every district, as would several other proven voting methods that are consistent with our traditions of voting for candidates rather than for parties. Switching to fair voting would balance congressional elections between the parties. Under the current system, there are 195 seats that favor Republicans by at least 54% to 46%, but only 166 seats that favor Democrats at that level of safety. Under the fair voting plans for the U.S. House, there would be 195 Republican-leaning seats, 192 Democratic-leaning seats and 42 seats that would regularly swing between the parties . And while the major parties would usually win the seats leaning their way, voters would have credible general election options within their party of preference as well as among third parties and independents. As a result, fair voting plans for the U.S. Congress would make every "super district" competitive, with all voters able to participate in congressional elections that would not be predetermined by district partisanship. Both Democrats in Republican districts and Republicans in Democratic districts who are now essentially disenfranchised by winner-take-all elections would have real chances to help elect a representative. In fact, every single super district would likely elect at least one Republican and one Democrat in our plan, with a more representative mix of voices elected within the parties as well as between them. Representation would broaden in other ways as well. Independents and third parties would have a real chance to hold the major parties accountable, better reflecting the rising number of voters who choose to register to vote as independents or outside the two party structure. As we explain in our new Representation 2020 campaign, representation of women would likely soar because of greater incentives for more women running and winning - of the 11 states that use at least some multi-seat districts for electing their state legislatures, 6 are in the top 10 in representation of women. Racial minorities would almost certainly win in far more areas of the nation - our analysis of the six southern states running from North Carolina to Mississippi, for example, shows that the number of African American voters in a position to elect a candidate of choice would more than double in every one of those states under fair voting, and more candidates preferred by African American voters would win seats. Although congressional Republicans earn a partisan advantage under current rules, it's not necessarily good for their party. Unlike what would be possible in a fair voting system, Republicans can only win in certain areas of the country. As they become more and more reliant on these strongholds, their presidential candidates become less successful in being able to build support in Democratic areas where more voters live. As a result, the identity of the Republican party at the national level has become more closely associated with positions that today seem to be a minority view among Americans in presidential elections. Since 1988, Republicans have only won the popular vote in a single presidential election, when George Bush narrowly won re-election in 2004. It may be no accident that Republicans took over the House in 1994 with an approach that represented a turn to the right for the party's national image. For the party to evolve with the times, it would help them to have the opportunity to contest and win seats everywhere in the country. But that broadening of their tent won't happen easily if we continue to elect Congress with a single-member district, winner-take-all electoral system. Fair voting and multi-member districts are fully constitutional. For the first half-century of congressional elections, at least one state - and usually many more - elected House members in statewide elections. The movement to single-member districts was ironically driven by the goal of partisan fairness, avoiding distortions from the use of statewide winner-take-all elections. We know today from the experiences of fair voting systems at a local level, in Illinois state legislative elections and in most democracies around the world that fair voting methods provide a far more reliable means of accomplishing that goal. We should expand that local and state use of fair voting. But we also shouldn't let Congress off the hook: the "people's house" demands an electoral system that truly represents the people. FairVote is launching a new campaign for fair House elections to be in place before the time of the next Census and redistricting in 2020-2021. Make no mistake-there is one predominant reason why the Democrats lost the House in 2012 and why so many seats are lopsided: winner-take-all elections in single-member districts. Independent redistricting commissions would help mitigate the problem of unfair dominance of congressional elections by one party, but the underlying GOP tilt would remain. Unless winner-take-all is ended, Democrats will continue to suffer from a system that is fundamentally rigged against them. All voters will suffer from voting in noncompetitive districts, not being able to hold their Members or congressional leadership accountable, and not having the ability to earn nuanced political representation beyond the poles of the two parties. It's time for a real change in American congressional elections - and for that, Democrats and Republicans who want to compete in all corners of the country should join with all underrepresented Americans to identify the true cause of the problems with our House elections. It only stokes the growing partisan divide to take the easy way out and put the blame on the opposing party. The real enemy isn't particular parties or personalities, but our decision to keep winner-take-all rules in place that let 51% of voters determine 100% of the representation. Winner-take elections divide us rather than bring us together. To get every American on the same side, we need to reject winner-take-all and promote shared representation, competitive choice and more accountable leadership by adopting fair voting systems of proportional representation.